From highly acclaimed picture book maker, Rachel Bright, comes a visually stunning, feel-good picture book filled with Yu Rong’s distinctive, awe-inspiring papercut artwork. The snow is coming – Bear can smell it! Squirrel is so excited – he’s never seen snow before! But when the snow arrives, Bear suddenly falls sick. Can Squirrel still bring some silvery, sparkly, magical whiteness to his best friend? Featuring a cut-out window in Squirrel’s oak tree home, giving readers a sneak-peek to the wintry world outside, this delicately-crafted book captures the cosy, cuddly feeling of sharing a snowy night with a loved one, and is the perfect read for parents and children to treasure together – at Christmas and all year round. A bear, named Bear, and a squirrel named Squirrel live together in the forest. One night Bear predicts that there is snow on the way. The next morning they wake to find the ground glistening white. The two friends want to go and play together in the snow, but Bear is sick, so Squirrel has to go out and play by himself. At first he has fun, as this is the first time he has seen snow, but then he starts to miss his friend. Squirrel then comes up with an idea to take a snowflake back to Bear. After searching for the perfect one, he eventually finds it and puts it in his pocket, to give to Bear. What Squirrel hadn’t realised though was that snow melts and by the time he gets to Bear there is nothing in his pocket. 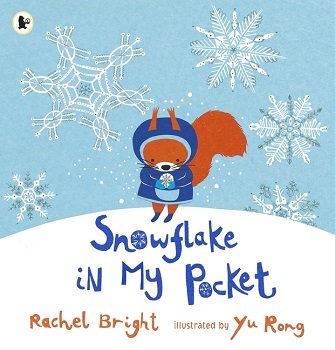 The Snowflake in my Pocket is a sweet tale of the love and friendship that Bear and Squirrel share. I loved the connection between the two very different animals. Bear is very wise as he has lived on the earth for a long time and seen and done lots of things, where Squirrel is young and is witnessing things for the first time. The book is appealing, and colourfully illustrated. With the wintry weather fast approaching this book will make the prefect bedtime story. Rachel is a writer of words, drawer of pictures and champion of silver linings. She exhibits widely, writes tirelessly and frequently creates slightly unhinged characters. Her written work includes children’s stories and poems, clever advertising copy and lots of other stuff besides. Her illustrative work is a smorgasboard of giant, hand-printed poems, mind-bogglingly detailed gouache illustrations and a cacophony of quirky prints and etchings. She explores the lovliness of words and the magic of pictures, revelling in a world of jam-eating miniature bears and other made-up animals. Her work aims to capture a free way of thinking – one which makes you feel anything is possible, a feeling all too easily lost with the end of childhood. When we’re all grown-up, sometimes we just need a little nudge to remember it’s been there all along. *Rachel has also been an air hostess, a garden designer and a lifeguard. She often runs a really long way and was once invited to the selection of the British ultra running team. She also once won a date with Man of the millennium and has been trying to live it down ever since.